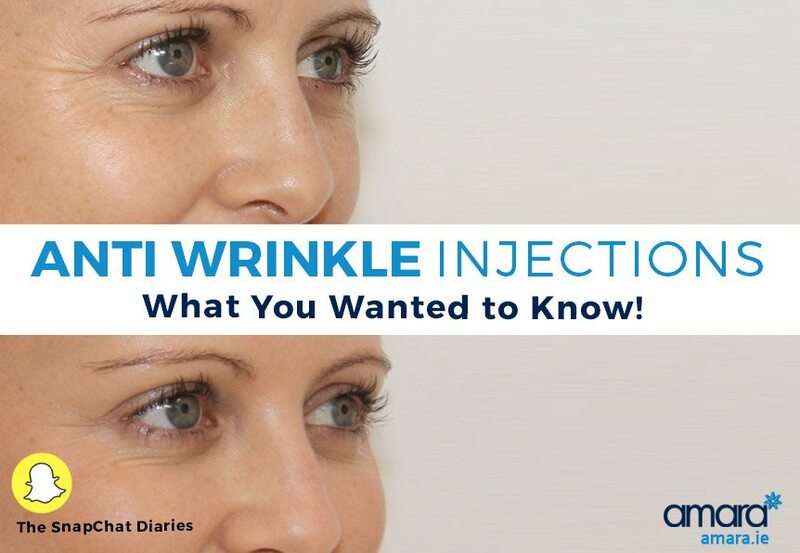 Anti Wrinkle Injections - What You Wanted To Know! This blog was a request from one of our followers on Snap Chat (amaraclinic) who wanted to know more about anti wrinkle injections. Though anti wrinkle injections may seem scary to some people they are actually quite simple and extremely safe. 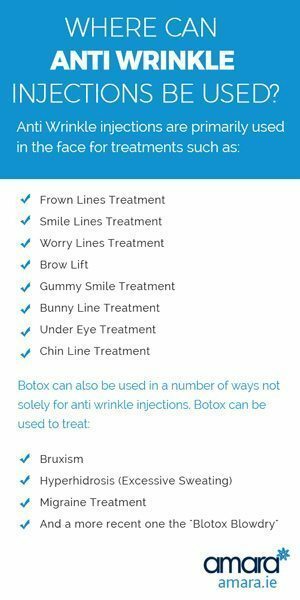 Anti wrinkle injections most commonly use Botulinum (Botox), which everyone has heard of before, to relax the muscles in the area where it is being injected. By relaxing the muscles this prevents movement which causes wrinkles and lines. Filler such as Juvederm can also be used as an anti wrinkle injection, these plump up the area where it has been injected to smooth out any lines or wrinkles. Where Can Anti Wrinkle Injections be Used? Botox can also be used in a number of ways not solely for anti wrinkle injections. Botox can be used to treat; bruxism, Hyperhidrosis (Excessive Sweating), migraine treatment and a more recent one the ‘Blotox Blowdry’. More and more uses are being found for botox every day as it continues to be in more common use. Anti Wrinkle Injections using botox typically last 4-6 months depending on the person and take about 2 weeks to take full effect. Anti wrinkle injections using dermal fillers typically lasts 12- 18 months. How long exactly they last varies from person to person and depends on factors like how much do you move your face or if you talk a lot? Are Anti Wrinkle Injections Noticeable? At Amara we prefer a subtle approach that gives you deniability in any anti wrinkle treatment that you may have. As botox anti wrinkle injections do not take full effect for up to two weeks many people like to pop in on their lunch break for an anti wrinkle treatment and go back to work without anyone noticing anything. With dermal filler you will have a noticeably fresh faced appearance that will be obvious to you right away however it is not immediately noticeable that this was due to filler. In fact, one client of ours was upset that her husband didn’t notice a difference when she came home that day, it was only weeks later when he saw a photo of them together that he noticed how old he looked next to her! Do you have any other questions about anti wrinkle injections or any of our other treatments? If so just let us know. Also if you’d like to arrange a consultation for an anti wrinkle treatment of your own just get in touch! This is some great information, and I appreciate your point that anti-wrinkle injections last for four to six months. I thought they would wear off after maybe two months, so I didn’t realize that they lasted so long! I’ve started getting a fair amount of wrinkles, and it makes me self-conscious, so I’ll definitely look into getting injections to help that. Thanks for the great post!